Keys to Tulsa is a film based on a novel by Brian Fair Berkey, adapted by Harley Peyton and directed by Leslie Greif. It hit theatres in April 1997, was released on VHS in March 1998, and on DVD in December 2002. The black sheep son of a wealthy Tulsa family returns to the world he had renounced and is forced into a blackmail scheme with his high school sweetheart’s menacing husband. When he helps the only eye witness to a murder, he gets caught in a web of revenge, deceit and redemption. Eric plays Richter Boudreau, the “black sheep son,” Deborah Unger plays Vicky Stover, the high school sweetheart, James Spader is Ronnie, the menacing husband, and Joanna Going, Cherry, the exotic dancer who is the only eye witness to a murder. 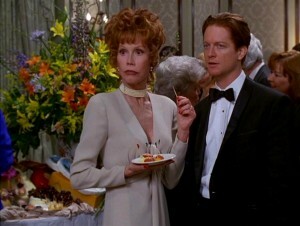 Mary Tyler Moore plays Richter’s mother Cynthia and James Coburn, the businessman whose son Ronnie plans to blackmail.